Kieran and Michele Mulroney have previously wrote and co-directed the yet to release "Paper Man" starring Jeff Daniels, Lisa Kudrow, Emma Stone and Ryan Reynolds. The duo also penned the long talked of "Justice League: Mortal" which hasn't seen the light of day and will possibly never be made. They would in principle write the sequel that would put Sherlock Holmes biggest foe, Moriarty. 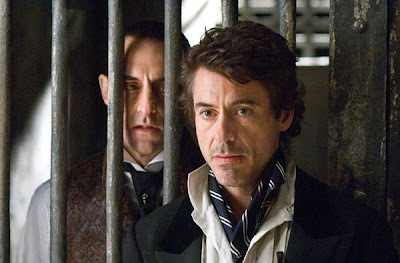 Considering Robert Downey Jr. is a very busy man, it is smart of WB to begin pre-production of a 'Holmes' sequel. Downey Jr. is also attached for further Iron Man films, "Cowboys and Aliens", the looming "The Avengers" movie, rumored for a remake of "Harvey" and also a new film from The Vampire Chronicles playing Lestat. If Warner is going to be able to get a second "Sherlock Holmes" made, it will be vital they have a time table so Downey Jr. will be able to continue in the role. This news also resurfaces the rumors of Brad Pitt playing the nemesis of Holmes in the sequel. Producers have in fact talked with Pitt about the role, although no deal is yet in place. You'll remember earlier this year it was rumored that Pitt will have a brief cameo as Moriarty and this week's report gives reason to speculate those rumors were true. WB however, has remained vocal that Moriarty's appearance in "Sherlock Holmes" is very minor and he only remains in the shadows never revealing a particular actor.